The action movie is one of Hollywood’s most profitable and reliable genres; it represents everything that Hollywood signifies. Since the 1970’s when George Lucas and Steven Spielberg defined the blockbuster and set a standard for much of the genre, the action/adventure film has remained a mainstay of Hollywood. While the language of the genre has evolved with the times: the 80s, with a focus on hyper-masculinity and the body; the 90s centered on blue-collar, everyman heroes in extraordinary situations; and modern action films featuring superheroes, larger than life spectacle, and the highest of stakes (someone is always trying to destroy the world), the basic structure of the production culture has remained unchanged. Through it all, the action movie remains a defining staple of the Hollywood system. Many of the classic action films, however, emanated from a particular group of talent in the late 80s and 90s. In fact, some of the best action films of the 90s feature the same core group of talent and producers. The decade’s best films were defined by Tony Scott, Don Simpson, Jerry Bruckheimer, and Michael Bay. Starting with Beverly Hills Cop (1984) and including Top Gun (1986), Days of Thunder (1990), Bad Boys (1995), The Rock (1996), Con Air (1997), and Armageddon (1998), Scott, Simpson, Bruckheimer and Bay created some of the highest grossing action films of all time. In doing so, they also established specific stylistic and narrative conventions that define many action films to this day. It began in the 1970s, with seminal blockbuster films, Jaws (1975) and Star Wars (1977). As a new cultural phenomenon, and a different kind of entertainment value, these films defined a new genre: the blockbuster. Going forward, with these massive successes setting a new standard, the industry began to codify the elements of blockbuster productions: release windows (the summer tentpole), oversized budgets, the action genre as a standard, and mega-grosses. But within this framework, the action films that were produced would come into being as products of a specific time and context. In the 1980s, the action genre was defined primarily by one thing: the myth of the American man. Strength, machismo, hyper-masculinity, masochism, martyrdom, and myth were the defining characteristics of a period of action films. Many film historians would claim that this was a response to the damage done to masculinity as the result of the Vietnam War. 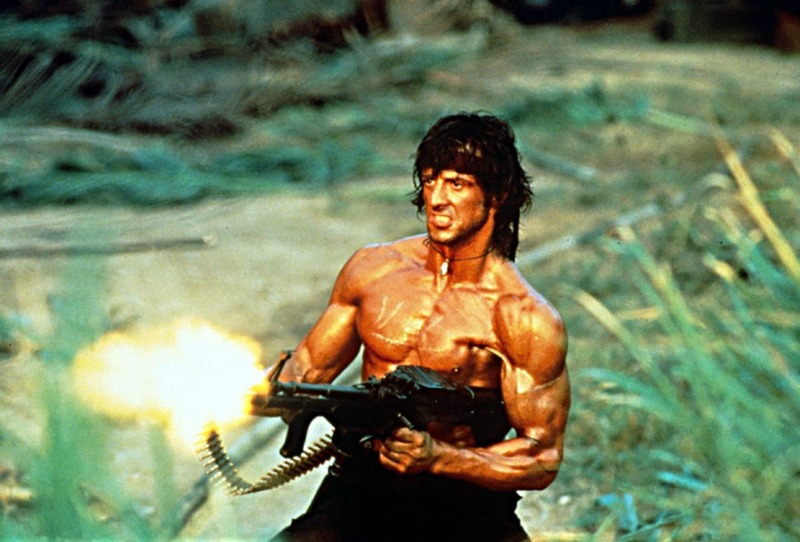 While that can be argued, inarguable is the fact that with movies like First Blood, Conan the Barbarian, Forced Vengeance (all 1982), and stars like Sylvester Stallone, Arnold Schwarzenegger, Jean Claude Van Damme, and Chuck Norris, the hyper-masculine male body was the centerpiece of the genre; it served to reinforce a character’s power. The films operated on the notion that one man, a pinnacle of physique, would be the savior, and that strength, guts, and glory were the resolution to any challenge these characters would face. This mythos, of unreal strength, massive bodies and muscles, and ultimate physique culminated in James Cameron’s Terminator (1984), which literally took hyper-masculinity to the extreme, turning the body into a machine, rather than a flesh and blood human, susceptible to harm. Terminator marked the apex of monolithic masculinity as a defining characteristic of the action genre. Around this same time different conceptions of the action film would begin to proliferate at the box office. In 1984, following the release of The Terminator, came Beverly Hills Cop, which would mark the producing team of Don Simpson and Jerry Bruckheimer’s first full-fledged foray in the action genre. With this film, the action genre would no longer be defined by the male body. In fact, somewhat the opposite, the leading men of action films became blue-collar, everyman types. Eddie Murphy’s Axel Foley was quicker with his wit than his fists, and so it would go with Riggs and Murtaugh (Lethal Weapon, 1987), and John McClain (Die Hard, 1988), as well as Speed (1994), Bad Boys (1995), and Con Air (1996). Sarcasm, wit, and ingenuity were their weapons – and guns, of course ­- instead of muscles and masculinity. With these action movies the stakes were comparatively low, the characters were grounded, and action was often dictated by story. But consider it, also, the Reagan coalition casting office: mostly white, socially conservative, blue-collar workers; think of Die Hard as the perfect example, a blue-collar hero against a changing society, bureaucratic, corporate, and affluent, with globalization always lurking in the background, these were the underlying threats. 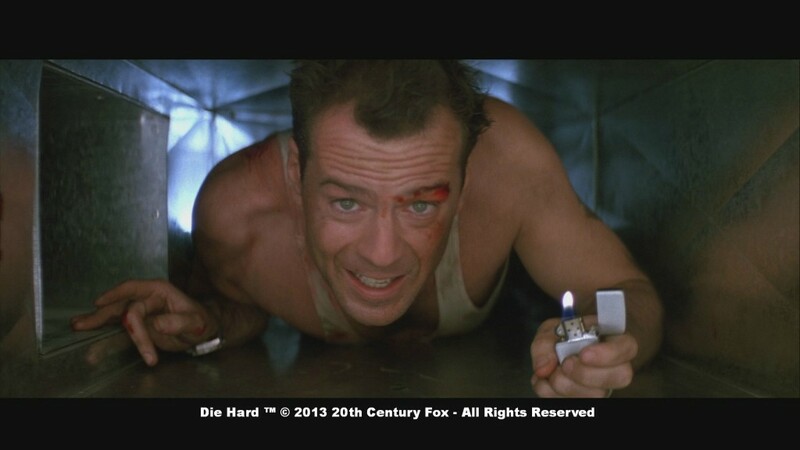 There was a lot more going on in Nakatomi plaza than just terrorists blowing up a building and stealing some money. Another part of the everyman, blue-collar hero films came from Tony Scott (who also worked with Simpson and Bruckheimer): the occupational hazard action films, such as Top Gun (1986), Days of Thunder (1990), True Lies (1994), and Armageddon (1998), the concepts for which were derived more from the occupation of the characters than the action set pieces they would provide the context for. 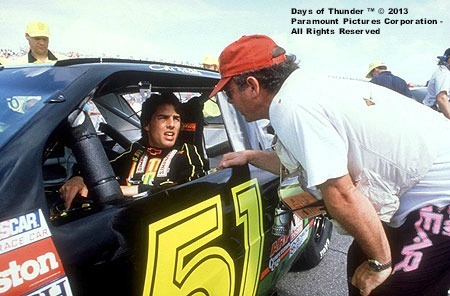 Top Gun was inspired by an article about the Navy’s actual Top Gun program, Days of Thunder was conceived when Tom Cruise got the chance to drive a stock car, and the latter films still reveled in their character’s occupations as the driving force behind their characters or the narrative. During this period, the new stylistic and aesthetic conventions from Scott, Simpson, Bruckheimer, and Michael Bay would infiltrate the rest of the production culture. The standard would become overblown action, indulgent excess, self-awareness, and parody without silliness for the sake of it. Aesthetically, the films would feature a greater emphasis on movement and action through editing and camera movement. 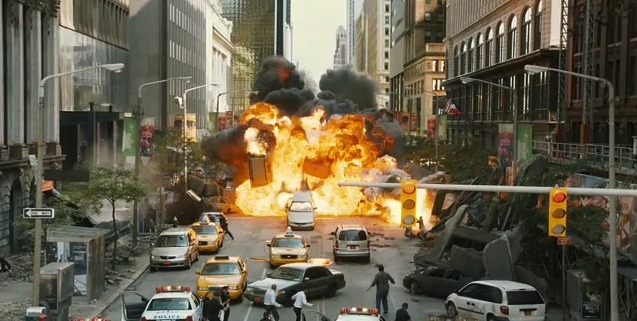 Think of Michael Bay’s swooping camera or Bruckheimer and Bay’s edits, quicker than what audiences were accustomed too, it emphasized the notion of action and kinetic energy even in less action-intense scenes. The films became all about motion in every aspect: high velocity pans, tracks, and fast paced edits. Action cinema in the 90s became about enveloping characters in pure spectacle. In stark contrast to the 90s action films, the 2000s would be defined by their large, even more overblown, action set-pieces first and foremost. Story and character took a back seat to fitting a story around action which had already been detailed as the core of the concept, think Transformers (2007), Avatar (2009), and the Marvel universe films. The necessary number of explosions are calculated and then story and character follows. Gone were the low stakes of stock car racing, fighter pilots, terrorists blowing up a building, or a bomb on the bus, now the crisis is always the end of the world. Moreover, the most recent spate of action films have moved beyond the body, and beyond reality. The Matrix was the seminal film to unbound the body and to set reality to the side. Since then, superheroes have become the norm, the everyman became just the CGI extra running out of the way of the skyscraper which was tumbling to the ground. And this, too, can be traced to a specific time and context in American culture, when there are no heroes, government is an abject failure, humanity has no grand vision nor aims for collective achievement, and so, if regular people are so ineffectual, of course we turn to individuals that are superhuman. Audiences collectively long for a singular, easy way to save the world, more so now than ever, and superheroes are an easy way to avoid the larger challenges of collective action and individual responsibility, to displace hope onto those that are beyond human because humanity itself seems so incapable of the challenges ahead. 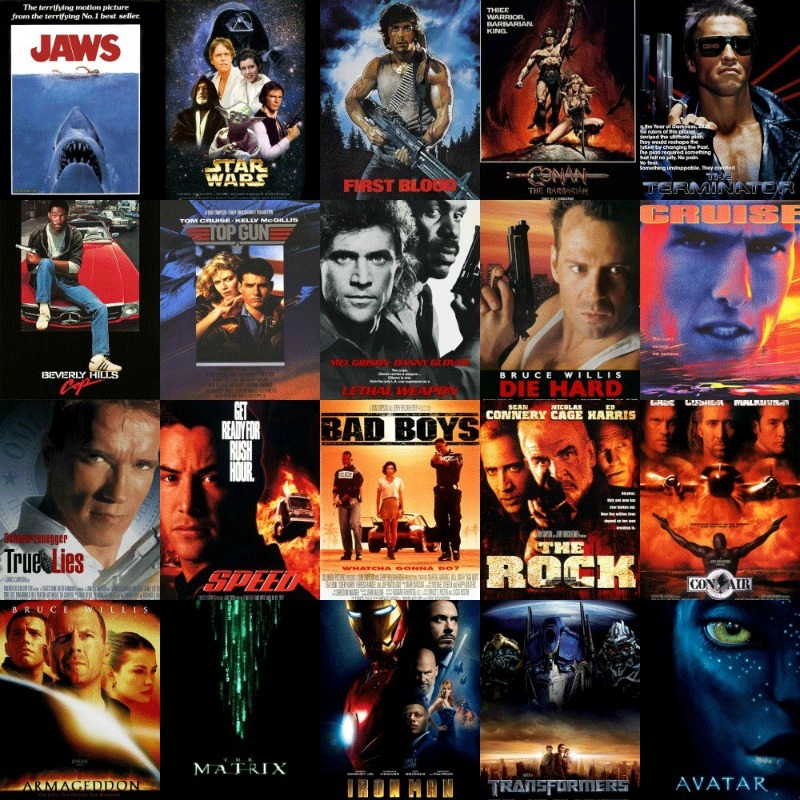 Action films set the tone for the period in which they are produced, they are a product of the culture and the production culture that produces them. Since the 70s gave way to the blockbuster, the action genre has been Hollywood’s most bankable enterprise. And it’s because action is our most easily consumable genre. It requires little from the audience accept for a willingness to be taken over, from the movement, the energy, the heroes which are stand-in for larger cultural conceptions of crisis and resolution. And the action movie will always continue in that vein, as a way for us to both interpret culture and see our own conceptions of a period in American history boiled down to easily digestible narratives of good/bad, threat/survival, resistance/submission, hero/villain. But some things will never change, the action film will always be defined by an aesthetic of movement and energy, a production culture of big-budgets and mega-grosses, narratives of triumph, and a collective experience of catharsis for all that ails the world. Experience 90s action with the following films, now showing on HDNET MOVIES.